KU offered the perfect major for me – I could earn a Bachelor of Fine Arts in Art History through the School of Fine Arts (now the School of the Arts). The same number of studio courses were required as Art History courses. I could indulge my desire to make art and study art history in equal measures! My studio courses consisted of some art and design basics, photography, and as many ceramics classes as I could fit into my packed schedule. I would spend the weekends in the clay studio, losing track of time and losing myself in creative flow. It was so wonderful! My favorite clay at the time was porcelain. I loved the smooth and elegant feel in my hands. (The small test piece pictured was sagger-fired with copper wire emerging from the hole and wrapping around the vessel. Sadly, a piece of the vessel was broken off in a move.) 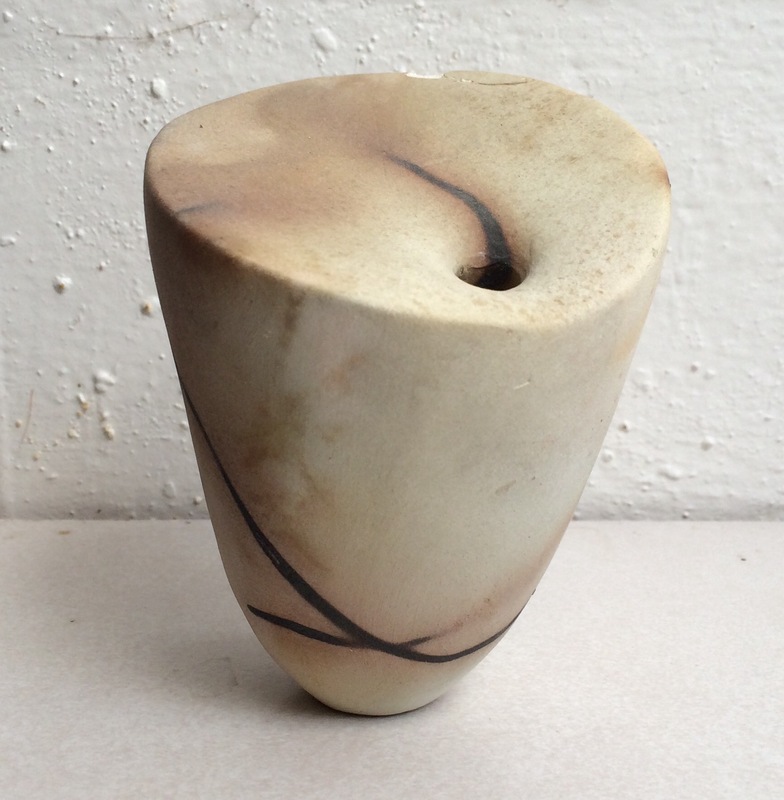 Often I experimented with firing the hand-built vessels in a variety of dried materials in smoke firings. The surprises on the surfaces thrilled me. My 3D design professor, Eleanor DuQuoin, was demanding. I have a vague memory of hearing she had studied at the Bauhaus when she was young. One of our assignments was to go to the hardware store and buy a small roll of 18 gauge wire. We were to cut a number of 6″ pieces and straighten them. Then we had a test: she would roll each section down a slope to see if they traveled straight or veered left or right. I spent so much time trying to perfectly straighten those sections of wire! At the time, her demands seemed a bit much, but in hindsight I’m very thankful she pushed me (gave me a lower grade in that class because she “expected more” from me) and learned that excellent craftsmanship is a priority in making art. 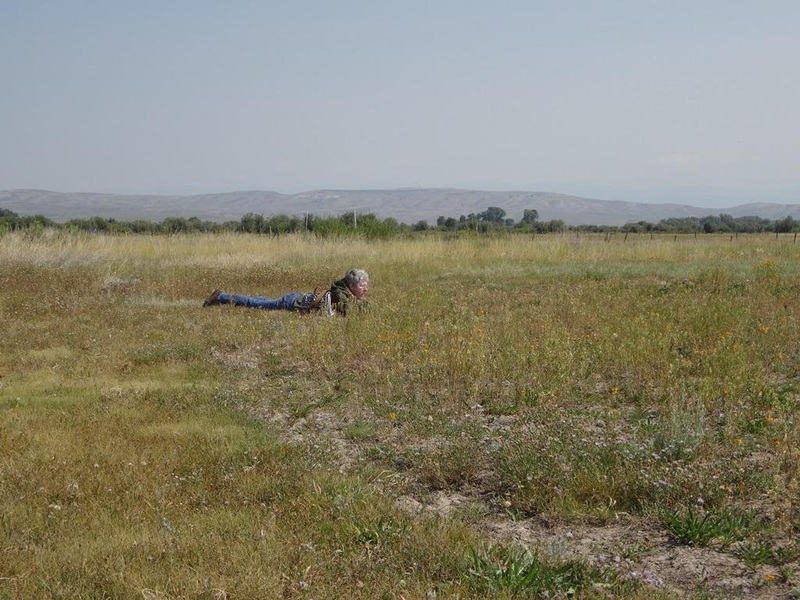 It was under Eleanor that I presented my first land art concept, a kinetic sculpture to be installed on the high plains. I crafted the model using wire, and used my hair dryer to demonstrate how it would move in the wind. Now that I’ve finished cleaning out my studio (for the most part), I’m done posting on artifacts. Time to make stuff! This pithy statement rings true for me. I found my soul at KU. 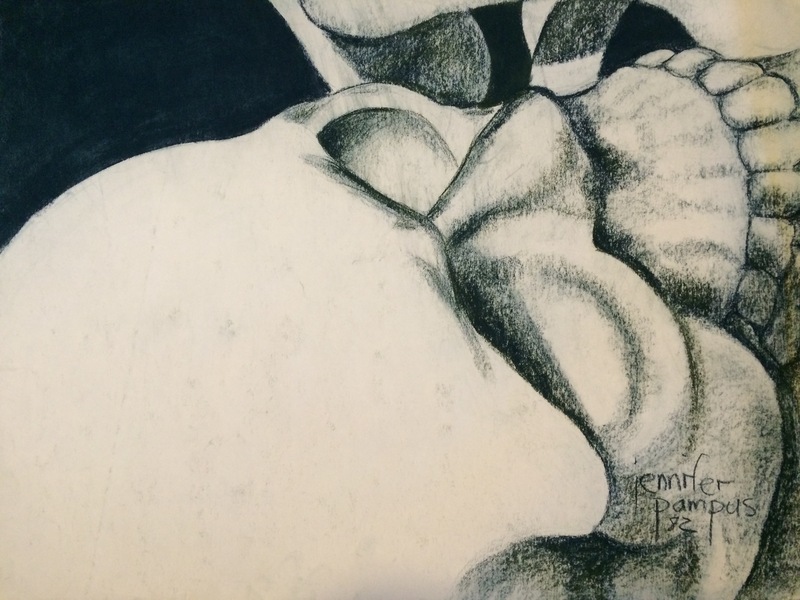 I developed artistically (learned to not blush in Life Drawing and enjoy the challenge of drawing the human figure), and flourished in art history classes. To learn the context of the art I was most interested in studying, I took all the German history and Greek history classes I could. My professors were excellent and challenging. Fritz and Shirley brought me into this world and Lana welcomed me home in Lawrence, but we moved to Colorado when I was a mere 6 weeks old. A couple of times a year we packed up the family vehicle and traveled across Kansas to visit relatives and friends. I sledded on The Hill with my cousins, remembering to bail just before sliding into Potter Lake, and explored the KU campus with my sister and friend Bob. I learned the local lingo, the layout of the city and how to get around. There was always great anticipation and excitement associated with going to Lawrence, so I viewed it as a magical place. KU was where I belonged. I was awarded an art scholarship, and was hired as a student assistant in the Murphy Art & Architecture Library in the Spencer Art Museum. I developed friendships with an eclectic and diverse group of people, ate lunch by a Louise Nevelson sculpture outside the museum, went dancing to celebrate the completion of German finals, and was one of 16,000 singing the haunting Rock Chalk Chant at basketball games in Allen Fieldhouse. I thrived. Ahhhhh! Finally! A clean and organized studio. Phase 1 is complete. My studio is a very small space in the basement of my 92-year-old house. I turned about 340° to take this panorama. I didn’t really need all the bones, wasps nests and interesting seed pods I’d collected over the years that were havens for cobwebs. (I saved some!) They took up a lot of space that I needed for materials, like old rusting pipes that I’ll someday use to make objects. Part of the space juts out from the foundation, has a corrugated plexi roof, and served as a greenhouse by a previous owner. I get a ton of natural light. But it’s really cold at night and very hot in the day. I sewed a shade to help moderate the temperature extremes and diffuse the direct light, but it doesn’t help as much as needed for the place to be comfortable. The roof has started leaking, so this summer I plan to replace the roof, insulate it, and put in an energy-efficient skylight. (Fred will do most of the work – I’ll help and do the finishing.) Thanks to the fellowship I received from the Wyoming Arts Council, my studio will be a more comfortable place to make art. Cleaning out not only made for a more functional studio, but finding old work caused me to reflect on my creative journey and confirm that my current work wasn’t an abrupt change in direction. I came across a couple of paintings and mixed media pieces from 20+ years ago that incorporated objects into a landscape in which they didn’t belong. This is a road I’ve been on for much of my life. The studio was clean just long enough for me to take this photo – there’s a new mess. After a freshman year of finding my path in life, and an incredible week-long art history class at Mesa Verde studying the ancestral Puebloans with my favorite professor Chip, I went home for the summer. Once again, I was asked what kind of job I would get with an art history degree, and in spite of my plan to graduate a year early and head off to get a master’s degree, my father got in my head and convinced me I needed to become a high school teacher so I could get a job. The art education track at the University of Northern Colorado was quite different from the fine art track, and I wouldn’t have time to take any more art history classes. So I did what any confused college student would do and changed my major. I switched to English education, figuring I could teach and be an author at the same time (I had to explore that “A” on my list of what-I-want-to-be-when-I-grow-up! See previous post.) As a swimmer and age-group coach, I decided to minor in P.E. to get a coaching certificate. Surely I could get a job after graduation! I registered for Short Story, Poetry and Linguistics in the English department and Volleyball in Physical Ed, and my father urged me to take Business 101. The English classes were great! I especially enjoyed writing in Short Story. My professor was very demanding, but I learned so much. Volleyball: let me just say that I still duck when an object is flying toward me (many in the class were on the UNC volleyball team). Business 101 was a test of my mental fortitude. The professor droned, the subject did not hold my interest, and in each class I was afraid I might run out screaming. So it was a great day when I had to drop Business 101! While stretching with my swimming team mates one evening, I tore my hamstring. (That’s what happens when you show off and say you can do something you can no longer do!) Because of my schedule and class locations, the only way I could get to classes on time was on my bike, and now I was unable to ride. I also had to drop Volleyball (darn) and quit swimming. Mentally and emotionally I was stripped bare. 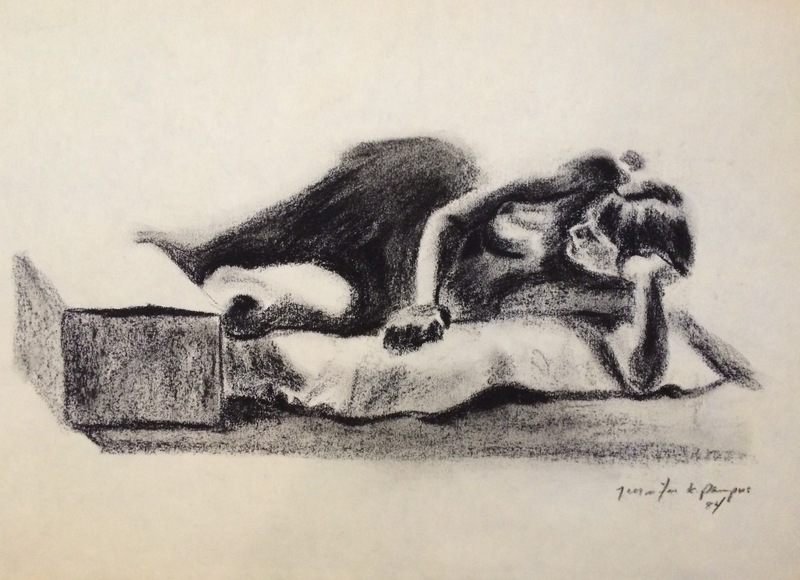 Finding this freshman-year charcoal drawing while cleaning my studio brought back the memories of losing myself as a sophomore. My mom was my rock as I spent many hours on the phone with her, crying and wondering what to do. I missed art and art history. I needed to get back to it. But I also felt like a fresh start would be beneficial and I should leave UNC. I swallowed my pride and met with Chip: he’d wondered where I’d been since he hadn’t seen me around the art department. He talked to me about transfer options and recommended several schools in the University of California system. While I really wanted to apply to a couple, there was no way I could afford them. I was despondent. When asked what I wanted to be when I grew up, I was stuck at the letter A. At various times in my formative years I wanted to be an astronomer, an artist or an author. My family had a set of science encyclopedias that I would sit with for hours, thumbing through the pages. The pictures from space most intrigued me, and I enjoyed our family excursions out in the country to examine the night sky and name the constellations. I remember watching the moon landing on TV in July of 1969 as a 5-year-old, then looking up in the sky afterward trying to make sense of people being in space. My sister Lana and I enjoyed constructing rockets from Estes kits and launching them, and I wrote a report on Robert Goddard in 5th grade. I took astronomy and physics in high school and enjoyed both classes immensely, but I wasn’t much of an explorer. I was afraid of what might exist out there, having a fear of extraterrestrial beings. (Thank you, parents, for taking me to see Chariots of the Gods when I was 10. I had nightmares for years about that!) But I was compelled as a teenager to visit Devil’s Tower, WY, because of Close Encounters of the Third Kind. I must have felt the need to confront my fears head-on, but they remained. A consummate daydreamer, my head was always somewhere else. I was more into creating new worlds than seeking to discover those in our universe. As much as I could I sought solitary spaces for living in a place of my own creation. I drew pictures and maps of make-believe countries and wrote stories, and I created habitats and buildings in Mom’s garden for the imaginary people who drove my little Matchbox cars. It seems I was always making up a place. My favorite classes were art, literature and creative writing. Lines, words, imagery, poetry, positive space/negative space, foreshadowing, foreshortening, interpretation – I loved it all! My teachers who taught these classes were my favorites. I became an artist, but I’m really fortunate that I also have friends and colleagues who are authors. As the project manager for traveling exhibits at my day job, I’ve had the privilege of working with and getting to know some astronomers, astrophysicists, planetary scientists and rocket scientists. All these amazing people, those who discover and those who create, inspire me. Recently I began excavating years of neglect in my studio. (It’s been much more fun to go in, make stuff and leave the mess for later!) Well, those messes piled up to the point that it was just plain disgusting. 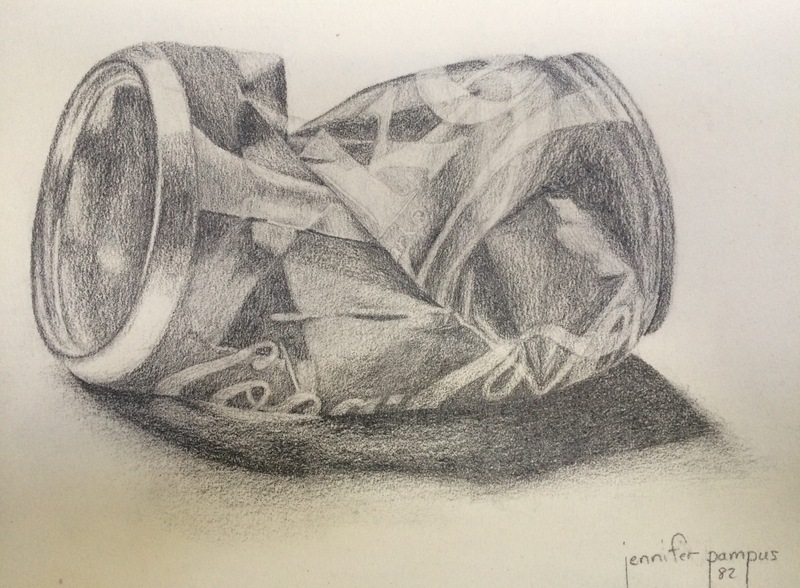 What I’ve discovered under all the dried up bottles of glaze, hardening tubes of paint, dye pots, collections of grasses and seed heads, cobwebs and dust are some artifacts from my past, like this study of a crumpled can I drew as a freshman in college. At this point in my life, I’d only been to one art museum, the Nelson-Atkins in Kansas City, on an excursion with other campers at the University of Kansas art camp when I was 17. I bought my first art book, on Andrew Wyeth, at the museum. I thought he was the most amazing artist, and I wanted to be like him. I thought all art that wasn’t representational or realistic was not really art, only revealing my lack of knowledge and understanding. After that summer at art camp, I seemed headed to KU to study art. But when one is young, many voices (especially those of your parents and high school guidance counselors) get in your head and attempt to give you direction. Somehow I ended up headed to the University of Denver to study business, a practical major, and I’d received an honors scholarship. I attended the summer orientation at DU, signed up for business classes, and went home miserable. While there, I’d met a girl carrying a portfolio. She was majoring in art. I had a horrible feeling in my gut that I was missing my life. Three weeks before school was set to start, I told my parents I couldn’t study business. I needed to go study art, but was told DU was too expensive if I wasn’t going to “get a job” with my degree. A friend of mine attended the University of Northern Colorado in Greeley, so I decided to see if they would accept me at the last minute. They did, and gave me a full tuition academic scholarship, which made my dad quite happy! Drawing 1 was eye opening. There were some very talented people in the class! But soon I realized that many thought so highly of themselves that they couldn’t take criticism from the professor. They started dropping out of class. Yes, it was hard to hear when my rendering wasn’t very accurate, but I kept working and started learning to really see. I took ceramics classes and passed the professor’s demanding cylinder test with flying colors. Whenever I could, I headed to the clay studio and spent as many hours there as possible. But what really changed my world was my 8am art history class with Chip Coronel. My knowledge of art history was nil, and I was a sponge in the class. Chip made the subject matter come alive. I couldn’t get enough! I looked forward to class each morning and to studying every night. Tests, identifying slides and answering essay questions, caused adrenaline rushes that I thrived on. That spring Chip allowed this freshman into an advanced art history class, African Art, and I was on my way. I had a plan for my life. I would become an art historian and throw pots in my spare time. An avid reader of adventure stories, Lana often led our play into an excursion of some sort, but this was a first. 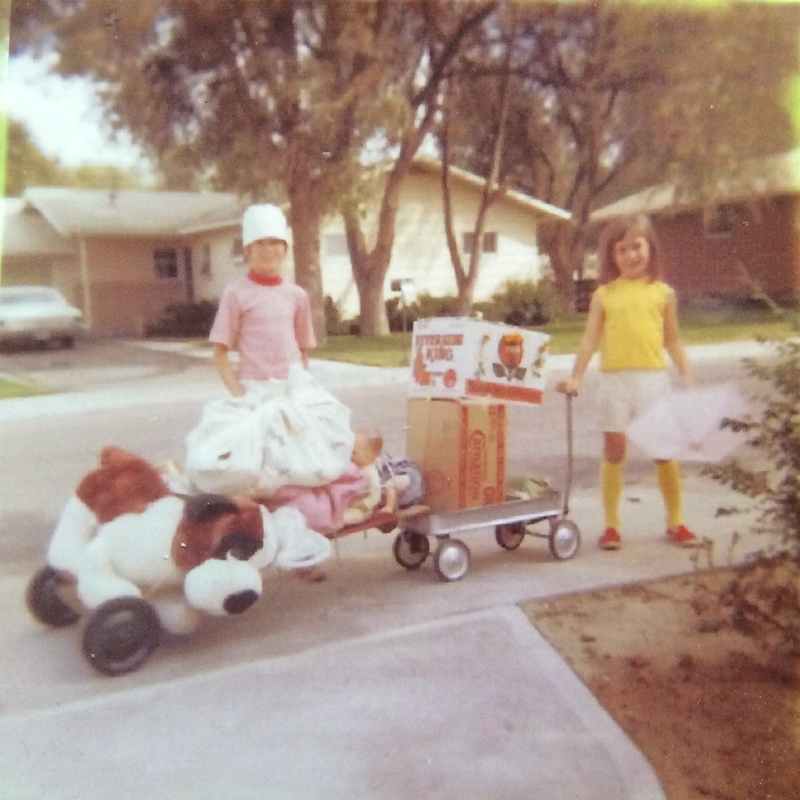 We packed up our most important belongings (her doll Rosie, my stuffed Saint Bernard), piled them on the wagon and an extension of some sort, and off we went. There we were, headed out on our adventure and Mom made us stop to snap a picture for the family photo album. (I’m the one with the matchy-matchy yellow shirt and socks.) This day had to be recorded for posterity. Where did we go? Across the street, past two houses to the empty lot with a pile of dirt! (The lot was next to the house on the right in the photo. We’re at the end of our circle driveway.) No, it wasn’t far, but in Lana’s mind it was far enough to get back at our parents. I was a bit scared, being the peace-loving, conflict-avoiding soul I still am. Once we arrived at the lot, Lana announced to our neighborhood friends that we had run away. They seemed impressed that we were so bold! We played all day – no chores! I started getting homesick, looked toward our house (our street curved so it was visible) and saw Pop watching us over the wood privacy fence. I can just imagine he and Mom keeping an eye on us all day and alternately being angry and laughing at the situation. As the sun sank in the sky that evening in September 1970, I started getting really homesick, hungry and tired. I began to cry, and Lana decided it would be best if we went home. Surely our parents had learned the lesson that she wasn’t going to do anything she didn’t want to do! I remember nothing else from that day, so we must have been welcomed home with love, fed, and tucked into bed. Looking back on this adventure brings me joy and sadness. Lana died nine years ago from brain cancer. She inhabits my earliest memory when I was 2-years-old, and she inhabits my dreams at night. I feel the hole of her absence every day. I missed her holding my hand through my journey with ovarian cancer and telling me everything would be okay. I long for the adventures we had planned for our old age that we’ll never take. I’ll never be as adventurous as Lana was – she went on to have many more after this one, but I do enjoy running away! Sometimes on a Saturday morning, I’ll tell Fred we should run away. He’s game! We don’t go far, just far enough to get out of doing chores. 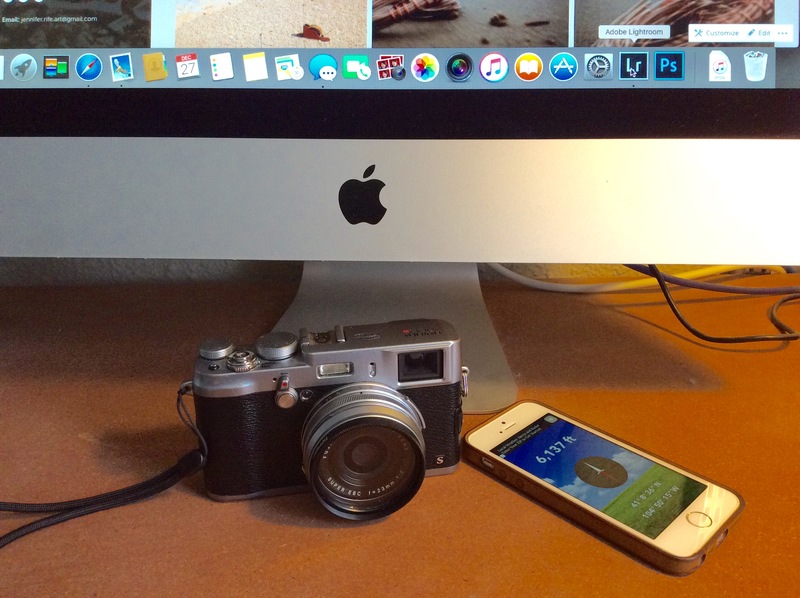 These are my technological tools – a Fuji x100s camera, an iPhone 5s with the Altimeter app, and a Mac with Adobe Creative Cloud Lightroom. I’m not a gadget person. I don’t look forward to getting new devices or software. I learn only what I must to express my vision. When I got my Mac a few years ago, I started using Apple’s photo-editing software, Aperture, which aptly handled processing raw images. I prefer to keep editing to a minimum, so I didn’t ask for much. But now Apple is no longer supporting the software, so I’ve switched to Lightroom. It’s probably for the best, but since I don’t relish this kind of change I’ve put off even the basics of importing images off SD cards and processing the raw files for months. Now there’s a backlog of installation images that I need to organize and process. Ugh. 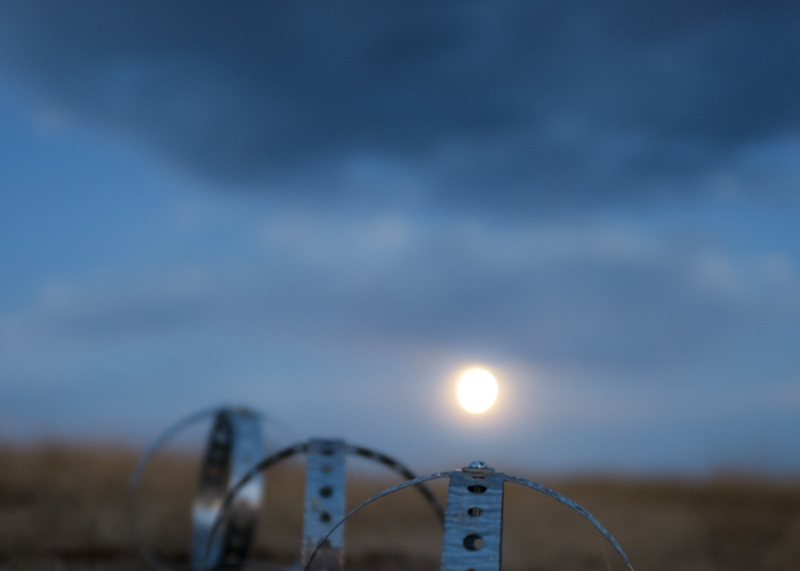 I much prefer creating the objects and installations over focusing on a screen for hours! Since it’s now very cold in Wyoming (temperatures are often sub-zero with the wind chill) I’m spending more time inside. This past weekend I came up with a plan to organize the files and imported 200 some images. I’m glad it’s done. As I’m learning more about Lightroom, processing the images is becoming a little more enjoyable. The best part is that the task takes me back in time to the experience of creating the objects and the installations, and I get lost in reverie, looking forward to creating more. “If you can find a way to be truly ambivalent about what people think about you as an artist you’re completely freed up because you just end up doing things that turn you on creatively…” – Amy Poehler. It isn’t easy to exist in this mindset. What about critiques? What about the opinions of jurors and gallerists? The buying public? When my work turned in a new direction, I wrestled with “what will people think?” I’d received mostly positive feedback on my work over the course of my career – sometimes critiques in college art classes were brutal and demoralizing, but I learned from them. What’s not to like about colorful paintings of humorous subject matter, ceramic mugs and vessels, coiled baskets and sculptural objects? I enjoyed creating art in all these mediums, but a conceptual urge lurked down deep that had not been satisfied. Who was I creating for? I wasn’t selling enough to sustain my life. I needed to satisfy that deeper urge, so I faced the reality that I might not ever sell another piece of art if I succumbed to it. I might not ever get juried into another exhibit. My work will probably never be shown at SOFA again. People may not like what I create. So what? I had to become ambivalent. 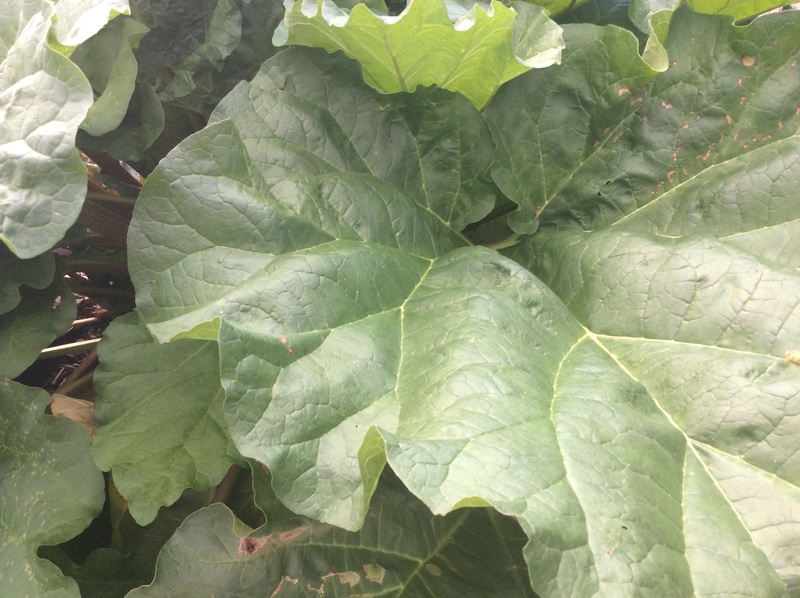 Rhubarb is considered a weed by some gardeners in Cheyenne. It thrives here and can’t be eradicated very easily. Mine came with the house, and I’ve found that it is one of my favorite plants because of its large leaves and the delicious sorbet and chutney I make with its tangy stalks, not to mention that no matter how hard the winter is it reliably returns each spring. A year ago today, June 9, I harvested a few pounds and put them in the freezer for later use. I had to keep busy that morning since I was fasting. At 1pm Fred took me to the hospital to have surgery to remove my ovarian tumor, and so began my cancer adventure. The rhubarb and I both had a bit of a rough summer last year – it got pummeled by a couple of massive hailstorms and I started chemotherapy. Both of us were really beat up and didn’t look too good once autumn rolled around. But we’re back! We both look pretty normal again (except for my surgery scars) and no one would ever know what we went through just by looking at us. I’m not quite as strong and energetic as I used to be, but I hope to get there. Maybe having the resilience of a weed isn’t such a bad thing after all. 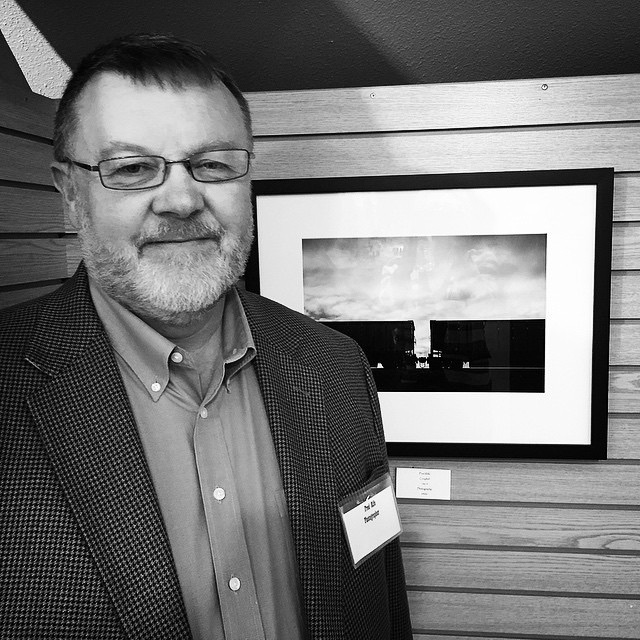 This photo is of my wonderful husband, Fred, and his piece “Coupled” that is currently on exhibit at the Cheyenne Depot Museum. We were married at 22, just a few days following our college graduations (me from the University of Kansas, him from the U.S. Naval Academy in Maryland). We’d known each other most of our lives since we grew up in the same small town, and we were friends for years before we ever started dating. We’ve been with each other through major illnesses and challenges in life, and I’m so lucky and thankful to have Fred by my side. He’s a very smart, kind and compassionate man, with a generous spirit. Our strengths and weaknesses balance each other. We’ve found a good working formula for our relationship: sometimes it’s about him, sometimes it’s about me, but it’s always about us. He tells me there’s been a creative urge lurking within him from an early age, and a few years ago he picked up photography. He likes playing with images on his laptop and mastering Lightroom. He’s read books and watched videos by David duChemin and other photography pros to improve his eye and technical skills. He’s my personal IT guy, as he enjoys the technological side of things much more than I do. Having never been to an art museum before we became a couple, he’s gone through many with me and our daughter (a PhD. student in art history), and when his work takes him to cities with art museums he visits them on his own. He questions, we discuss, and through it all he’s gained an understanding of art and developed a pretty good eye! There’s something about mid-life that makes a person say “what the hell, I’ll give it a go” and we try things that we wouldn’t have in our younger years when we worried more about what people thought. When it comes to creating, Fred and I have said that and are attempting to throw creative caution to the wind. With his support I was able to head a new direction with my work and with my encouragement he’s been able let go of predictability with his photos. It’s good to be coupled. 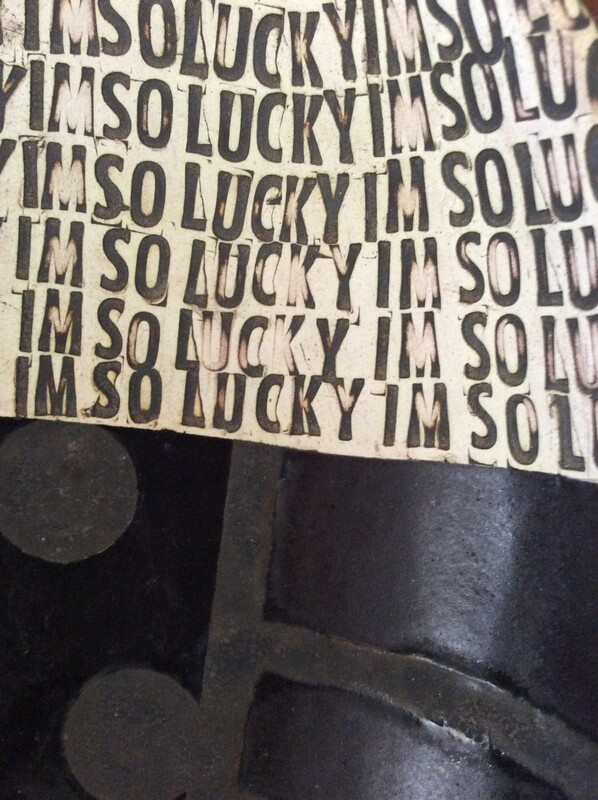 I’m so lucky! This image is a detail of a bowl created by my good friend and ceramicist, Connie Norman. I’m so lucky to count her among my art people who inspire and challenge me. Connie and I have gotten to know each other over the years after being introduced at a Wyoming Arts Council roundtable event. We’ve laughed and cried together through life’s ups and downs, and we had a great time traveling to SOFA Chicago a few years ago. Connie taught me “you can sleep at home” and while traveling you stay up late and experience all you can wherever you are! I’m so lucky to have actors, authors and musicians as some of my art people, too. Cross-pollination in the arts is very valuable to me as I find inspiration from creative people in other disciplines, and they also encourage and challenge me. While our mediums are different, our souls are kindred. I’m so lucky to live in Wyoming where we have an active and supportive state arts council. The staff are friendly, helpful and willing to travel all over the state to keep the arts flourishing. I’ve worked with them as an artist and through my job at the library.